China launched its first high-speed railway line, the Beijing-Tianjin high-speed train service, 10 years ago on August 1, 2008. The high-speed train, running at over 300 km per hour, takes 35 minutes from Tianjin to Beijing. The daily frequency of Beijing-Tianjin intercity trains has increased from 94 one-way services to 217, with 250 million passengers carried in the past decade, according to the Beijing Railway Bureau. The length of high-speed railway lines in China rose from zero 10 years ago to 25,000 km by 2017, accounting for 66% of the world’s total. More than 4,000 bullet trains run in China, carrying 4 million passengers every day, according to the China Railway Corp. When the first high-speed railway in north China’s Inner Mongolia Autonomous Region starts operation at the end of 2019, the trains will run on the 287-kilometer-long railway passing the regional capital of Hohhot, Ulanqab City and Zhangjiakou City in neighboring Hebei province. It will reduce the travel time between Beijing and Hohhot from the current nine hours to three hours. By then, all provincial-level regions on the Chinese mainland will have high-speed train service, except the Autonomous Region of Tibet. A network of eight east-west high-speed rail lines and eight north-south lines will be built, according to a railway development plan. 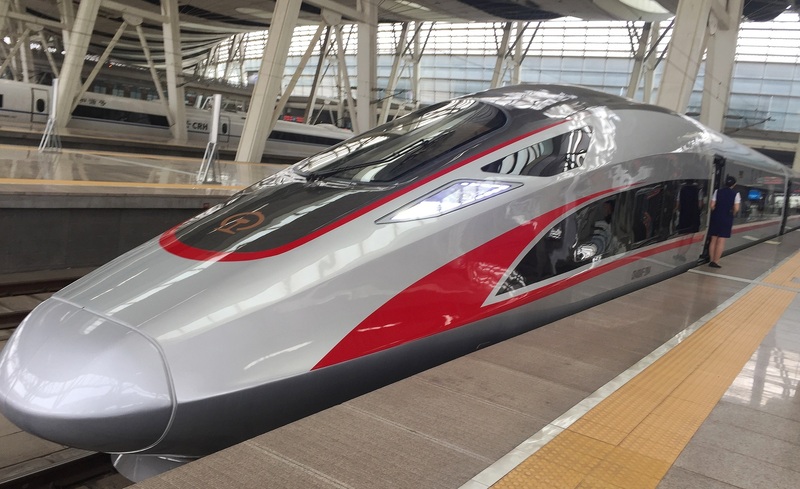 A high-speed railway connecting Beijing and Guangzhou has shortened the travel time across the 2,300 km distance to eight hours. The new Fuxing bullet trains travel at 350 km/h, going from Beijing to Shanghai in four hours and 18 minutes. By 2020, China’s high-speed rail length is expected to reach 30,000 km, covering 80% of the major cities. By the end of 2017, the high-speed trains had carried more than 7 billion passengers. Cargo delivery via high-speed trains started in 2016, with more than 500 cities used as pilot areas for express services. Recently, China has started to export its high-speed trains and technology. In 2014, China completed the construction of its first overseas high-speed rail in Turkey. In June 2015, China and Russia inked deals for 770 km of track connecting Moscow and Kazan. In October 2015, China and Indonesia signed a deal on the joint-venture construction of a high-speed railway between Jakarta and Bandung, the Shanghai Daily reports. Chinese engineers also completed the design of the world’s longest undersea railway tunnel, connecting the mainland to Taiwan. It would be three and a half times longer than the 37.9 km Channel Tunnel between Britain and France, which has a 160 km/h speed limit. Trains would travel through the 135 kilometer undersea section of the tunnel at speeds of up to 250 km/h by 2030. But rising political tensions between Taipei and Beijing could still derail the project. Work on the tunnel could take three decades to complete. 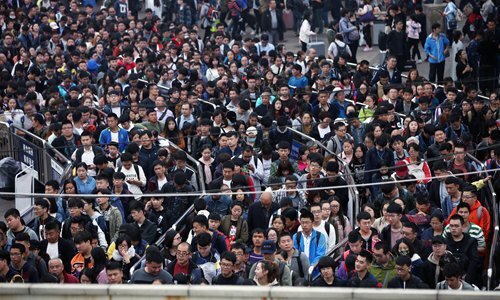 China’s transport system had to cope with millions more travelers during the National Day “Golden Week” as the number of trips made over the break rose 11.9% to 705 million compared with the same holiday last year. Holiday makers spent CNY583.6 billion, or 13.9% more than last year. The ‘Golden Week’ holiday – starting on China’s National Day on October 1 – was extended by one more day to October 8 because the Mid-Autumn Festival fell within the week this year. The number of outbound tourists was roughly the same as last year at about 6 million, but more travelers were opting to go travel by themselves rather than join a tour group. Since 2012, China has become the largest source of outgoing tourists, accounting for a large share of global tourism, Zhu Shanzhong, Executive Director of the World Tourism Organization said. 65 countries and regions are providing visa-free and visa-on-arrival access to Chinese citizens and, during this year’s National Day holiday, 88 countries and regions received Chinese visitors, up from 68 countries last year, CCTV reported. Russia was the most popular destination for Chinese tourists, followed by Thailand, Vietnam, Singapore and Malaysia, while Moscow was the most popular city, followed by St. Petersburg, Bangkok, Pattaya, and Singapore, according to the China National Tourism Administration (CNTA). Travelers made about 105 million train trips since the holiday rush started on September 28, the China Railway Corp (CRC) said. About 40% of the journeys were on high-speed lines. The number of travelers passing through Shanghai’s Hongqiao and Pudong airports between September 30 and October 7 jumped 6.6% to 874,000 from a year ago. Travel agencies in Shanghai organized trips for 104,000 outbound tourists, surging 62.4%. China will officially start operation of the world’s fastest train service next month, knocking an hour off the 1,318 km journey between Beijing and Shanghai. Seven pairs of bullet trains – named Fuxing, which means rejuvenation – will start operating from September 21. At present, the fastest trains in China, which have their top speed capped at 300 km/h, are named Hexie, or Harmony. China had briefly tried a maximum speed of 350 km/h, but a deadly train crash in Wenzhou, Zhejiang province, in 2011 forced the railway authorities to reduce the upper speed limit. Bullet trains have now become a key export product for China, so the government is keen to increase their speed. The Beijing-Shanghai high-speed route is one of the most popular, with around 600 million passengers since it opened in 2011, and it is also one of the most profitable in China. The operator of the route made a profit of CNY6.6 billion in 2015. According to the current train schedule, the fastest bullet train running between the cities takes four hours and 55 minutes, and most bullet trains take around 5½ hours. A one-way ticket costs CNY553 for a regular seat and CNY933 for a first-class seat. It is not known whether China Railway will raise ticket prices after the speed is increased. Authorities tested the 350 km/h services on some parts of the line last month and the results convinced officials they would be able to run at higher speeds along the whole line, the South China Morning Post reports. Foreign airlines’ services to or from China’s second-tier cities are facing increased local competition, which has led to a fall in profits on the routes, and more empty seats. According to figures from travel-aviation industry analysts, European carriers cut capacity on secondary China routes by 23% in the first seven months, and suspensions of those are likely to grow in the coming months. Early this year, British Airways (BA), for instance, closed its route from London Heathrow to Chengdu, after the airline said flights were “not commercially viable”, despite Chengdu being widely regarded as one of China’s most promising destinations for Europeans, well known for its hi-tech industry development. In October last year, Lufthansa also discontinued its route from Frankfurt to Shenyang. Flying on a Chinese carrier is a more natural choice, as Chinese travelers are more familiar with domestic airline brands and are more comfortable with the largely Mandarin-speaking cabin crew and ground staff, than they might find on foreign carriers, according to Corrine Png, Chief Executive of Crucial Perspective, a transport industry research firm. Earlier this month, United Airlines announced it would no longer be flying to Hangzhou, where China’s largest internet giant Alibaba is headquartered. Residents in second-tier cities were widely seen as becoming a lucrative customer source for foreign airlines, but according to experts the problem is that Chinese passengers prefer Chinese carriers, the South China Morning Post reports. The first high-speed railway in the Inner Mongolia autonomous region was opened on August 3. The new rail service reduces the journey between Ulanqab and Hohhot from 56 minutes to 39 minutes. The bullet train runs at 250 kilometers per hour. Ten services are scheduled daily. The new 126-km line will be part of a 286.8-km high-speed railway that will connect Hohhot with Zhangjiakou, co-host of the 2022 Olympic Winter Games, in Hebei province, and will be connected to the Beijing-Zhangjiakou railway, reducing travel time between Hohhot and Beijing from an average nine hours to less than three hours. Last year, China’s high-speed network reached 22,000 km, accounting for 65% of the world’s total high-speed rail. According to a plan released by the National Development and Reform Commission (NDRC), China will expand high-speed rail to 30,000 km by 2020, linking 80% of its major cities. By 2030, the network is planned to link all cities with populations of more than 500,000.